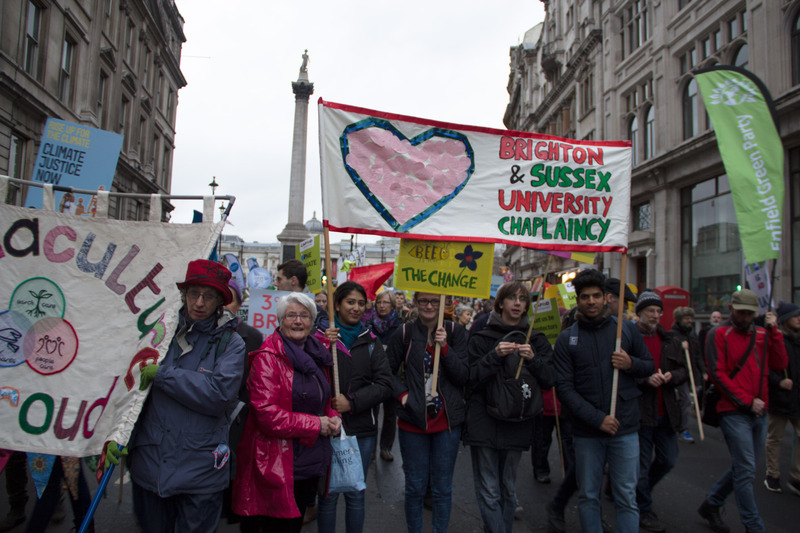 On 29 November, campaigners from University of Sussex joined over 50,000 people in The London People’s Climate March, calling for climate change action. Starting at Park Lane, marches took place in towns and cities across the world, on the weekend before the UN climate talks, known as COP21. The gathering took place just before David Cameron and other world leaders meet in Paris to decide upon a global agreement to stop carbon emissions from rising and protect vulnerable communities that have already been affected. Mariana Bush, 26, student of University of Sussex from Mexico, travelled from Brighton on Sunday because she said: “It is important for us to take action to tackle climate change, in order to protect our common home. Climate change is pushing the most vulnerable people further into poverty, this touches my heart. Believing that work leaders should work together to support the transition from polluting fossil fuels to sustainable energy for all, she joined others at the march to call for their support. Last year people from around the world gathered to call for a fair deal which would put those most vulnerable to the effects of climate change at its heart. This year’s organisers witnessed an even bigger turnout. In June, Pope Francis urged everyone to take better care of the world we live in, recognising the devastating impact climate change has on the planet’s most vulnerable people. CAFOD volunteer, Cosmo Lo, also a media student at University of Sussex felt inspired by the Pope’s words to take more positive action against climate change. In addition to that, he walks the talk by getting around the cyclist-friendly Brighton on his bike. “This could keep me fit and also reduce my carbon footprint”, he said. This month, the annual United Nations Cllmate Change Conference (COP21) is taking place in Paris. CAFOD, the official aid agency of the Catholic Church in England and Wales, will be at the United Nations Climate Change Conference, along with people from all over the world, to put pressure on world leaders to reach the agreement we need to tackle climate change for the love of human race and our common home. Shortly before Sunday’s march, participants from all different religions met at an interfaith service organised by CAFOD and other faith charities before the official march, to join together in solidarity in showing their commitment and love for the planet. Charlotte Church, famous Welsh singer-songwriter, ended the march with a bang as they joined the march to stand up for climate justice. CAFOD’s Campaigns Engagement Manager, Sarah Hagger-Holt, said: “The march was a chance for everyone to get involved and show the world we are prepared to act, because climate change is threatening earth, our common home, and pushing the most vulnerable people deeper into poverty. “With it being one day before the historic climate talks begin, the timing couldn’t be more important. Now more than ever, it’s important to show that we can unite across our differences to call for a better world for all. As part of the global campaign over 800,000 Catholics across the world have signed a petition to call for a climate change deal which will stop the poorest people from being pushed even further into poverty. CAFOD is campaigning on climate change because it is one of the biggest threats to eliminating poverty worldwide. Their One Climate, One World campaign calls for world leaders to prevent climate change pushing people deeper into poverty and support the transition from polluting fossil fuels to sustainable energy for all. With its climate petition already being signed by over 40,000 people, CAFOD hopes to continue bringing hope and compassion to poor communities across the world, standing side by side with them to end poverty and injustice. They work through the local Church to reach people and places that others cannot.